Here's a roundup of building, design and development news around Portland. The Redd by Ecotrust will take up two city blocks and function as an "urban ecosystem for the regional food economy." In its final phase of construction, it's expected to open for full operation by the end of the year. Here's a feature from Lost Oregon a couple years back on its history and vision. 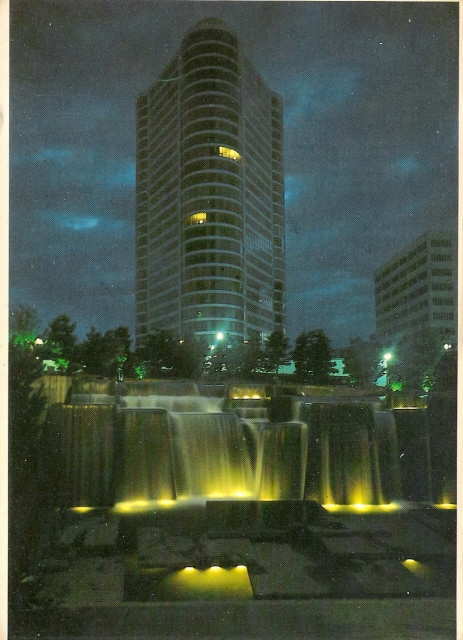 Portland Plaza and Lawrence Halprin's Keller Fountain put on a show via a postcard. O'Bryant Square closed until ...2023? The DJC is reporting that the redevelopment of downtown Portland's O'Bryant Square may take until 2023. The public space has been shuttered since March due to structural issues. The fence is so welcoming, too. O'Bryant Square in better times, circa 1976. That's not my headline —it's from the Guardian, and it's a good one. The nugget: walking around cities is good for your health and it's good for the businesses that inhabit downtowns. You just don't see the details when you're driving. Case in point: Hopping off the Orange Line at PSU yesterday to watch the Timbers (win, whew), we strolled up Jefferson to the Goose Hollow Inn for a pre-match beer. The furthest I'd been up Jefferson was OHS, but as we walked I was surprised that I'd never been on this stretch before. Just when you think you've seen every block in downtown. Crowdfunding for retrofitting local buildings is one intriguing idea. I like it for a couple of reasons: One, the return is making your own neighborhood better or more livable and two the return is pretty immediate. You invest in a building around the corner, you can see the work being done daily. I also like it because you don’t have to invest handfuls of cash—for a crowdfunding site like NextSeed, the minimum is $100. Throw in an adaptive reuse component and it sounds even more appealing. Rendering of the new version. Source. So, why NextSeed? According to their website, “investing isn’t just for Wall Street and Silicon Valley. Everyone can now access exclusive investment opportunities and build a financial portfolio with local businesses.” The company focuses on helping consumer-facing, brick-and-mortar businesses in the food and beverage, health and wellness, fitness, hospitality and co-working industries. The project currently has raised $13,900 by 30 investors. Webb hopes the Towne Crier will become a community gathering and destination spot as well as a local hangout for students of the Reed College neighborhood and locals from the Creston-Kenilworth community. The attached Treasury Cafe and Lounge will provide morning-evening service. Nighttime entertainment will include live music and whisky tastings featuring local musicians and artisans. Preeminent spirits expert Stuart Ramsay will oversee curation of the bar program. “There are so many stories and it feels like a patchwork quilt that’s perfect for a community project," says Webb. "There are many former customers in their 60s and 70s that have some great stories and we think it will help provide a sense of a place for them." The new space will also be a sort of repository for lost Portland restaurant artifacts: The stained glass windows are from Embers, the vintage neon Lounge sign (and its HVAC system) comes from The Overlook, while chandeliers from Der Rheinlander will grace the ceiling. If you’re interested in helping fund the project (or any project), NextSeed provides some pretty decent details, from key terms, location analysis, and revenue sharing summary. If you’re interested in retrofitting an old building in your own neighborhood, NextSeed is a good start. It doesn't actually finance real estate purchases (Webb owns the building; she purchased it in 2017) but it can help you get on the path, and you’re going to need to be nailed down with your financials and have some semblance of a business plan (this is real estate, not a widget you’re working on). His Box + One project was – at the time – revolutionary here in Portland. With its garage door windows and boxy exteriors– now commonplace – and small footprint of space, the project helped elevate an entire neighborhood. Other projects soon followed, some smaller, some larger all under his company name, Guerrilla Development. Since I’m keenly interested in small-scale, incremental projects that change neighborhoods for the better, whether that’s restoring an existing building – something Kevin says should be and could be done on any building, I was wrong in thinking that he intentionally built smaller projects. He talks about why he builds small – and not huge projects. This podcast (Built Blocks) was originally produced by me last year —look for a revamped Small-Scale City podcast soon. JLL’s Capital Markets experts today announced the sale of Indigo @ Twelve | West, a mixed-use property in the vibrant West End district of Portland, on behalf of an ownership group represented by Gerding Edlen and Downtown Development Group. Developed in 2009 by Gerding Edlen and designed by ZGF Architects, this dynamic mixed-use building offers 273 modern apartments, 85,000 square feet of creative office, 321 underground parking stalls, and curated, street level retail under one green roof. The anchor of the West End neighborhood, with its prominent, skyline-defining wind turbines, and incomparable multifamily amenities, Indigo is an iconic property that has consistently performed at the top of the Portland market. The transaction was conducted through the combined efforts of the JLL Northwest Capital Markets team. The commercial side was lead by JLL Managing Directors Buzz Ellis and Paige Morgan, and Vice President Adam Taylor, while Senior Vice President Mark Washington and Managing Directors David Young and Corey Marx led the multifamily team.